NiceTranslator is a fast, easy to use online translator designed with simplicity and functionality in mind. Being powered by Google Translation API, allowed the development to be focused on usability rather than hard coding. The interface is neat and straight forward, select the language(s) you want your text to be translated to, and start typing. As you are doing so, the translated text appears grouped by your selection of languages, really handy if you need to translate something to multiple languages at once. I tested the translation of "hello", and it was fun to see the translation change with every keystroke, as much as this is a serious application, but I couldn’t help stopping myself from exploring the fun side of it. 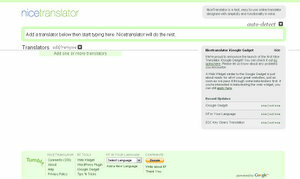 NiceTranslator is considered a new comer to the online translation services, and in my humble opinion is here to stay. It was created during the Fall of 2008 by two "almost-engineers", as they like to call themselves; Hats off to you guys. I saw your comment on the Nice Translator blog and wanted to stop by and say thanks for the great review! Your site looks great; consider me subscribed!